Each year, Swedish cosmetics giant Oriflame holds a directors meeting for its leading team from the Ukraine, Moldova and Belarus. This year, 6000 people gathered at Kiev’s International Exhibition Centre where Eurovision 2008 winner Dima Bilan performed beneath a large Martin rig. Despite the large size of the venue, set designer Nik Vishnevetski and lighting designer Dimitri Pruidze‘s sought to create a comfortable atmosphere and as Pruidze has worked with Bilan before, the Russian star was confident the design would meet his standards. 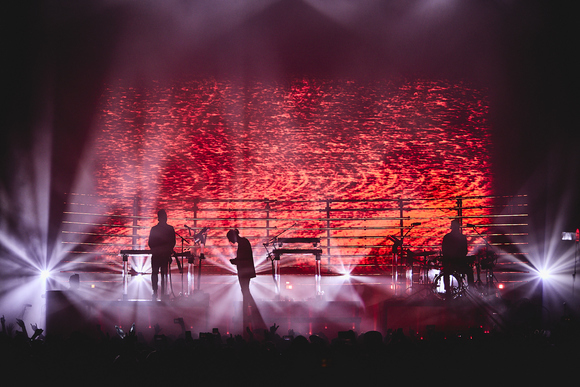 For the main stage rig, Pruidze chose MAC 2000™ series fixtures while a 12 m high by 26 m long truss housed MAC III Profiles™ and MAC 2000 Wash XBs™ for powerful beam effects and position washes. The front truss also held MAC 2000 Profiles™ for gobo projection onto set pieces along with MAC 2000 Washes™ to front wash up to 100 performers on stage. A separate rig was used for a special VIP zone for top directors and guests from Sweden. 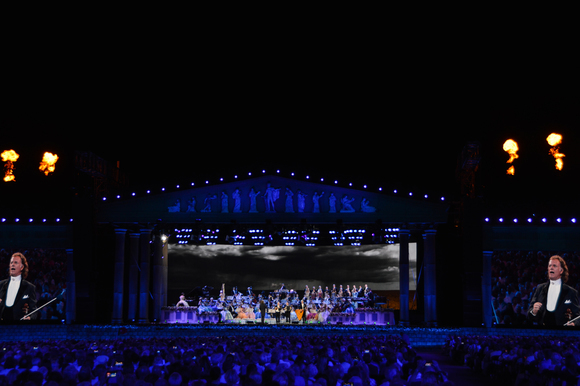 “The idea was to make a huge 20 meter truss star and to have it shine with all the colors of the rainbow, using the perfect color mixing of the MAC 301 Washes™,” stated Dimitri Pruidze, who also serves as Production Director at Gali-Leo Rental, supplier of the Martin gear for the event. Workhorse MAC 600™ and MAC 500™ fixtures were also used in the VIP area. 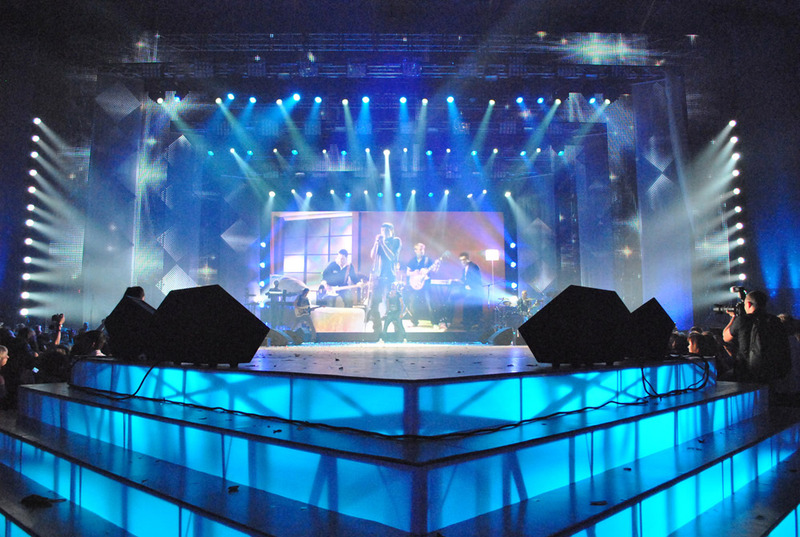 To complete the stage look, Pruidze incorporated 24 new MAC 101™ LED wash lights at the side stage sound towers and programmed them to mimic the profiles. “We got a perfect look on the stage because of them,” he stated. The mid-air projection canopy for beam visualization came from Jem K1 Hazers™, a continuously operating hazer with long hang time for greater fluid economy and an overall power consumption half that of other hazers in its class. It also includes a patented backup system that significantly reduces service and maintenance. Lighting control was from a Martin Maxxyz™, which Bilan says was no problem to program all lighting position presets from during Bilan’s sound check. He stated, “When you know the music it is very fast and easy to create looks from the song’s intro to the end using very fast Submaster A and Submaster B programming. When we saw that 8 universes was not enough for such a show and that the non-Martin lighting we were using did not have universes, we used a Martin USB Duo universe LightJockey™ connected to the Maxxyz via USB and got two universes more.” All video material for the show was synchronized by Vitali Pravdin via a Martin Maxedia PRO™ media server. The show was such a success that Dima Bilan performed two extra songs, reportedly because of the quality of the show and lighting effects.